Grass allergies are very common, as is hayfever, though severity differs from person to person. 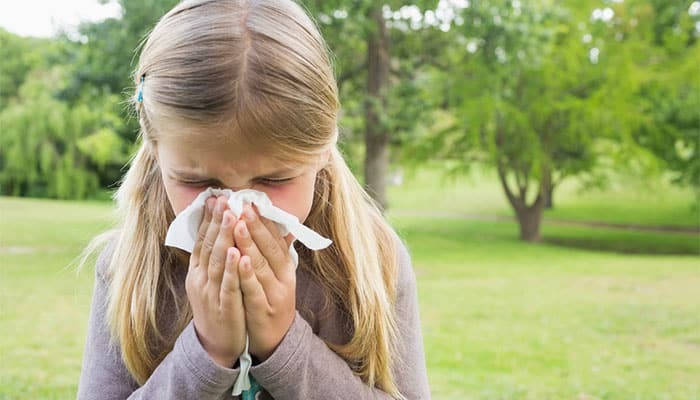 Sneezy nose, itchy or watery eyes, dry skin — there are many discomforts associated with grass pollen allergies. There are also a few ways to manage dealing with a grass allergy if you have a lawn. Let’s explore some of those solutions today. There are hundreds of varieties of grasses, all with slightly differing pollen densities. The grasses with the most pollen are cool weather grasses, such as Bermuda, Johnson, Kentucky bluegrass, orchard, redtop, rye, sweet vernal, and Timothy grass varieties. Buffalo grasses as well as any native grass like kangaroo and wallaby grasses, produce much lower rates of pollen. If you can, choose to lay down turf from a low-pollen grass. Ask someone else to. If there’s nobody else who can, you may have to take an antihistamine or wear a mask before going out to the yard. Allergies are the worst on dry, windy days because that’s when all of the pollen is released. Try not to mow on those days. Most grasses only produce pollen when they grow long. By keeping your lawn mowed (but not over-mowed) you’ll prevent pollen from being produced in the first place. As counterintuitive as it may sound, grass lawns help to trap pollen far more than they release it. As pollen from nearby trees and flowers is released, it may fall into the grass. Every time the grass is watered, the pollen will fall more and more deeply in between the blades. Lawns will keep the pollen there, rather than in the air, far more often. Though it will of course take longer to dry, hanging your clothes outdoors in spring and summer at the height of pollen season means you’ll constantly be covered in it. If you suffer from severe allergies, wash your clothes often and dry them inside. Honey produced from bees very close to your house or work can make your body adjust to local pollens. Have a tiny bite of honey — no more than a quarter of a teaspoon is needed — every day for a couple of weeks to improve overall hay fever symptoms. The closer it is produced to your house, the better. Though this will help you deal with pollen from flowers rather than grass itself, it will relieve your overall symptoms if you are susceptible to hay fever in the first place. To talk to someone about the best turf or grass varieties call 1800 040 981. See our full contact details here. Hi Quality Turf in Sydney can help you find the grass variety that won’t make your allergies flare up.